Welcome to Floral Fiesta!!!! 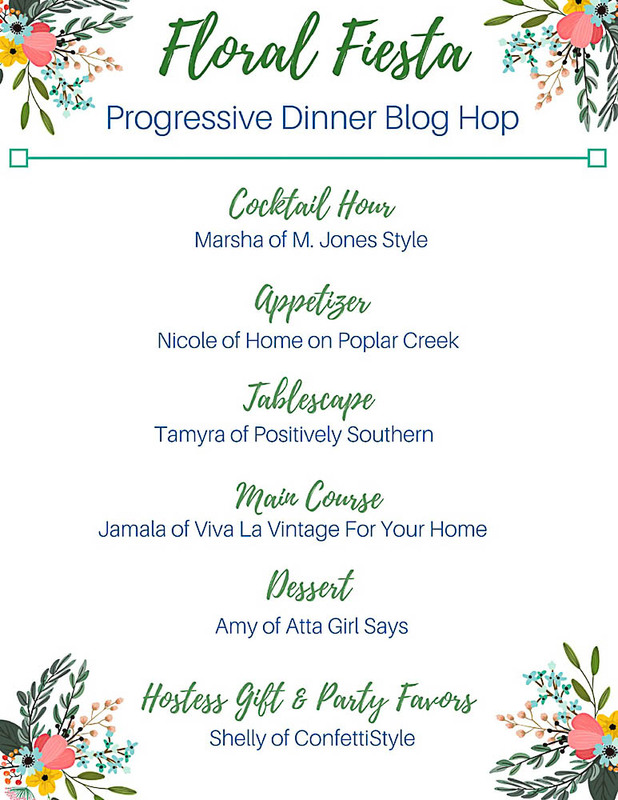 I'm so excited to be partnering with a few of my fav bloggers to share with you all our progressive dinner blog hop! If you have stopped by from Nicole's Home on Poplar Creek I am especially glad you are here! 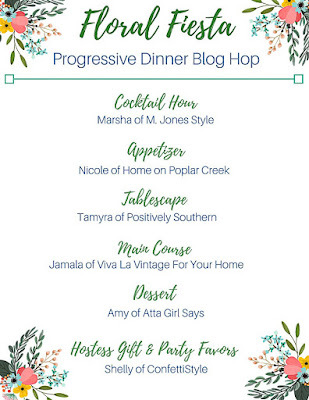 Since we've already had cocktails at M Jones Style and appetizers at Home on Poplar Creek I believe it is time to head over to the dining table and take our seat! For the spring soiree I thought a Tiffany themed tablescape would be ideal! For this tablescape I've used our informal china and crystal. I absolutely adore baby's breath and often times you will only see that in and around the vases in our home. This occasion I've added a few white flowers along with baby's breath just loosely arranged in a couple of Dollar Tree cylinders. Continuing the Tiffany color scheme I added matching candles in a hurricane along with treat boxes. I don't know about you guys but I think I'm ready to see what the main course is gonna be! You won't wanna miss what Jamala has prepared for us at Viva La Vintage for your Home. Such a beautiful tablescape, Tamyra. All my favorite colors! You pulled off the Tiffany theme perfectly. I'm hoping there's something from Tiffany in those gift boxes! :) So excited to be hosting this progressive dinner with you. I love the color scheme. You did it well as always! So beautiful Tamyra! I love the color palette! Ahhhh is what I'm feeling about this tablescape. So gorgeous and the Tiffany blue is the icing on the table. Love the napkins and rings. Beautiful job, Tamyra. Tamrya, You have definitely set a table fitting for a spring soirée. The Tiffany blue color is the perfect accent for spring. And the floral arrangements remind me a a filed of flowers you see on a weekend drive. Sitting at your table while enjoying the lemonade cocktail that Marsha is serving and the the watermelon appetizer from Nicole is definitely my version of entertaining in style. Such a bright, fresh spring table! Love this. The tiffany themed tablescape is refreshingly beautiful. The color is perfect for welcoming Spring in the air. Lovely... simply lovely..